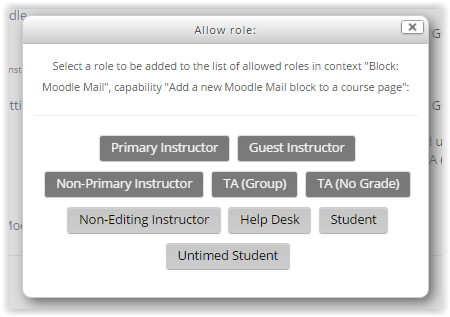 Each block in Moodle has a setting that allows instructors to edit the Permission levels for that particular block. 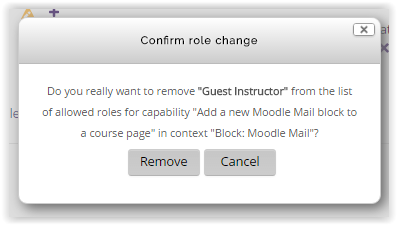 The Permissions are set to a role in Moodle - not an individual user or group of users. 2. Select the Edit button in the top right-hand corner. 3. 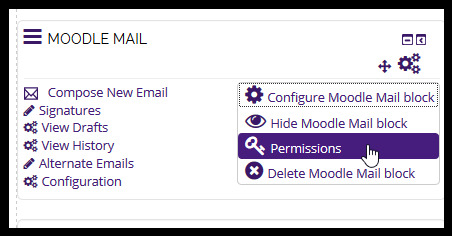 Select the Actions button (cogwheels) at the top of a Moodle Block, and then click Permissions on the drop down. 4. From the Permissions page, users are allowed to add/remove different user permissions. 5. To add a role to the permissions list, select the Add button. 6. Then choose the Role from the dialog box presented. 7. To prohibit access to a role, click the red X to the right of the role. 8. Select the Remove button to get of them.